You can see and change your preferences in the “Preferences” tab in Settings. To open Settings, click on the gear in the top right corner. There are two main types of preference: appearance and input. 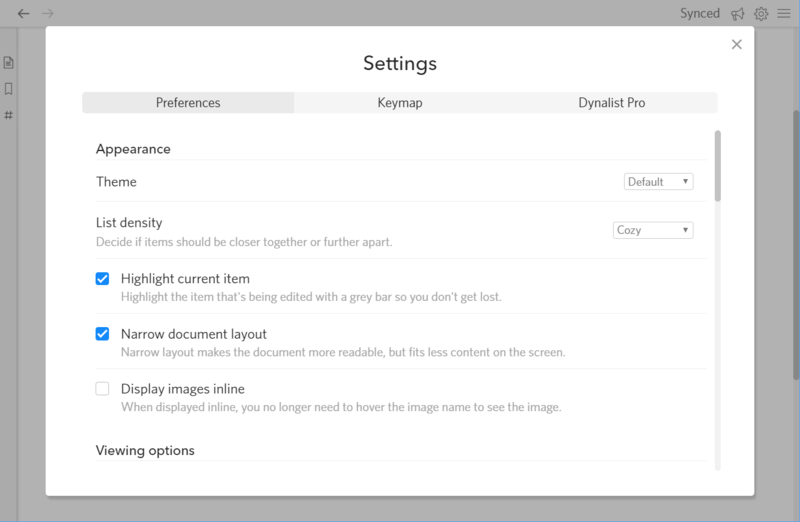 Dynalist has three themes right now: default, dark, and sepia. If your room is dark, using dark theme is easier on your eyes. If you read a lot on Dynalist, the sepia theme might be better for your eyes than the default theme. This setting defaults to Default (yeah right). You can control how much margin you’d like between two items. Compact is the tightest setting, and Comfortable is the loosest setting. This setting defaults to Cozy. To make tags stand out a little, turn on this setting. A light blue background (in default theme) or a dark grey background (in dark theme) will be applied to all tags. Turn it off if you don’t like the light grey border around your document. This setting is turned on by default. Turn on this setting if you want to know which item you’re editing right now. This can be hard as you have to look for the blinking caret. Turning on this setting will show a light background behind the current item, making it easy to find. When the document is center aligned, there are significant margins on the left and right side of the document. If you want to fit more text on the same screen space, you can turn it off. The possible drawback is that longer lines are usually harder to read. Turn on this setting if you want image markdown to show up as an inline image rather than a previewable link. The setting is turned off by default. Choose from Small, Medium, and Large. If it’s still readable to you, you can set it to smaller to display more text on the same screen space. This setting defaults to Medium. There are 8 built-in fonts in Dynalist right now. For serif font (think Times New Roman), go for Lora. For a monospace font for code, choose Consolas. This setting defaults to Whitney. If you write in Chinese, Japanese, or Korean, you can make use of this option to make your characters look better. This font will only be used on non-English text, so don’t worry about English looking ugly in the eastern-asian font. There are two options for each language, with one being serif and the other being sans serif. This setting defaults to Microsoft Yehei. If you have dyslexia, try out this option by choosing Open Dyslexic. It’s designed to make reading easier for people with dyslexia. If you like how it looks, you can download this font for free. Turning this on will enable your browser’s built-in spell checker. When a typo is spotted, a red squiggly line will show up underneath it. This settings is turned off by default, although we’re strongly considering making it be on be default. Because some languages have alternative keyboard layouts, it’s impossible for people who use those layouts to use normal shortcuts. For example, the Clear Heading shortcut ( Ctrl+Alt+0) will input “}” if you’re using the Polish keyboard layout. Right now there are four keyboard layout settings (in no particular order): English (United States), French (France), Polish (Poland), and German (Germany). If you find things not working with your keyboard layout, let us know! To see what shortcuts are affected by choosing each layout, see the keyboard shortcuts section. This setting defaults to English (United States). Choose between seeing 12-hour clock times and 24-hour clock times. This format is used for displaying dates and also in the timepicker. This setting defaults to 12-hour clock. Choose which day shows up as the first day in the date picker between Sunday and Monday. This setting defaults to Sunday. This option is Pro-only and it allows you to change how date is displayed. The date is displayed using Moment.js and the exact format can be found here. Additionally, you can enter "relative" to have dates always show up as relative dates (e.g. "in 18 days" or "3 months ago"). Note that you cannot mix "relative" with other date formats; it needs to be the only text in the preference field to take effect. Your custom date format will always override our default, so you won’t see dates show as “Tomorrow” or “In 2 days” any more. To use the default format, leave this option blank. For example, if you want your date to display as “2017/3/12 03:30pm”, write “YYYY/M/D hh:mma”. This decides whether timezone suffixes are generated by the date picker. They look like -05:00 and are used to denote the difference between your timezone and UTC, the Coordinated Universal Time. We recommend turning on this option if you’re working people in other timezones to avoid your 7 pm time being understood as 7 pm in their timezone. As the name suggests, this option allows you to highlight overdue items. When turned on, this option swaps the position of the zoom in option and the collapse/expand option. If other words, if you use zoom more often than collapse/expand, it might be a good idea to turn this on.